NEW DR. MOISES SIMPSER VACC CAMP Teenage Volunteers can only be full time, and would have to be full time for 2 years before they can be part timers. Volunteers can start by age 15 or by age 14 as long as they are freshmen in school. Need to be at camp every day from 7:30 am to 9:30 pm. Part time volunteers have to have been full time volunteers for 2 years on a row in order to be allowed to volunteer part time. Also, a part time volunteer has to participate every day, so it offers continuity to the campers. We do not allow weekend volunteers only; so those volunteers that leave for college whose spring break does not coincide, will unfortunately not be able to volunteer. All full time volunteers are required to submit the volunteer days/hours sign-up together with their application. All part timers that cannot determine their schedule so much in advance are required to submit the form as part timers with their application, and then submit an updated form with their days/hours not later than our first workshop. Community hour certificates will be given at our volunteer's appreciation dinner. Special Volunteers are groups and/or individuals that contribute to program administration, entertainment, producing or facilitating special events and respond directly to the Dr. Moises Simpser VACC Camp Coordinator. 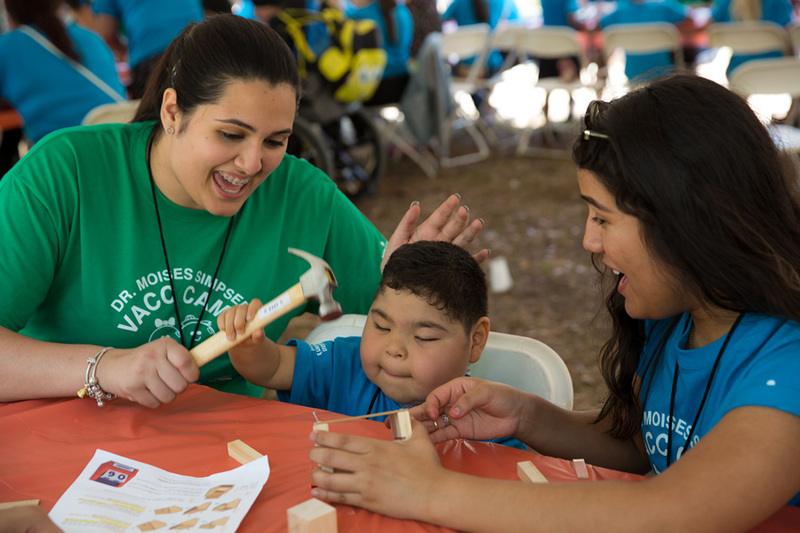 Medical Adult Volunteers, which encompasses nurses, respiratory therapist and other professionals, come and help during certain times at camp. These professional volunteers are needed ONLY during pool time, beach day, sailing day and parent's night out. There are medical volunteers that come year after year and are considered staff medical volunteers. We will have special time pledge flyers specifying the days and times these volunteers are needed and upon request of our medical staff. Non- Medical Adult Volunteers, any adult willing to help during certain times of the day. We will have certain hours for these volunteers to help. Mainly during breakfast time every day, during lunchtime we need help only the days we are at camp. They are also welcomed during set up and breakdown (especially if they can help with transportation of supplies). There will be special hour pledge forms for these volunteers to commit their time upon request. Handle camp chores, welcome campers, prepare and serve meals and snacks, keep the campsite tidy, pick up supplies and donated goods, provide general support to camp coordinator and other staff. Befriend campers: Most importantly, volunteers are there to join in all activities with campers, and be camper's playmates, helpers, tour guides and cheerleaders. Complete pledged/committed hours: full time is required for new volunteers so that volunteers will have ample opportunity to develop relationships with campers. Part time is acceptable only after being a full time volunteer for 2 years. It is for highly committed individuals that cannot pledge greater amount of hours. Part time is appropriate for volunteering afternoon and evenings on field trip days and any hours they can on none field trip days. Participation in Set Up and Break Down is a requisite to go to field trips and be accepted as a volunteer for the following year. This will not apply to high school students when they do not have the day off the Friday during set up, but they are required to be there during break down the last day of camp.